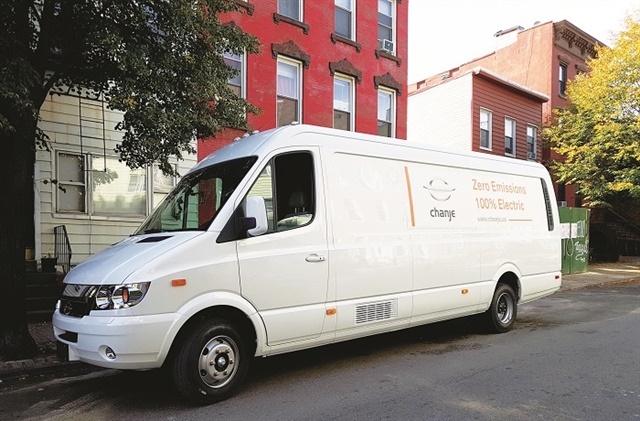 With my electric-vehicle driving experience limited to electric golf carts on one end of the spectrum and the Class 8 Transpower at the other extreme, I was wide open to a brand-new experience with the Chanje electric van. I have driven comparable-sized delivery vans before, such as Mercedes’ Sprinter and Ford’s Transit, both diesel- and gasoline-powered. I had some baseline upon which to base my evaluation, but the electric powertrain was new territory. Chanje’s V8070 is billed as a Class 6 truck, with a gross vehicle weight of 16,535 pounds, capable of a 6,000-pound payload in a 580-cubic-foot cargo space. It’s positioned as a last-mile delivery truck, intended for service in cities and urban areas where daily mileage usually doesn’t exceed 60-80 miles. The Chanje has an advertised range of 100 miles, half loaded on a full battery charge. On paper, it’s well spec’d and well positioned to serve the burgeoning package delivery market, or any other application where distance isn’t a limiting factor in the choice of powertrain. Read more about electric trucks in Jim Park's feature article, Electric Trucks: Zap in the Pan? It takes about eight hours for a full charge, but partial charges will restore much of the battery’s capacity in just a fraction of that time. The company claims a diesel-gallon-equivalent “energy economy” of 50 mpg, with a 70% reduction in energy costs compared to diesel. Chanje says the van was designed from the ground up as a battery-powered electric vehicle, so the basic structure of the vehicle was conceived to accommodate the battery pack, the motors and the rest of the electrics that run the thing. Under the hood, however, is what appears to be a traditional engine tunnel. Chanje says the shape is actually part of the crush zone protecting the driver in a frontal collision. The company plans to build a North American manufacturing facility in the near future, but the vans are presently fabricated in China and based on a Chinese design. The interior is as nice as you’d expect from a cargo van: nothing fancy, but comfortable and functional. The cargo space in the V8070 is generous and easily accessed by a pair of swinging rear doors or a sliding side door. The cargo section of the van I drove was finished in neutral gray paneling with a textured floor. The dual-wheel wheel wells, with 37 inches between them, protrude into the cargo area by about 7 inches, which will limit the ability to conveniently place a pallet on the back of the truck. There are several tiedown points located along the floor on the right and left side, and others could easily be added to the walls, I suspect. 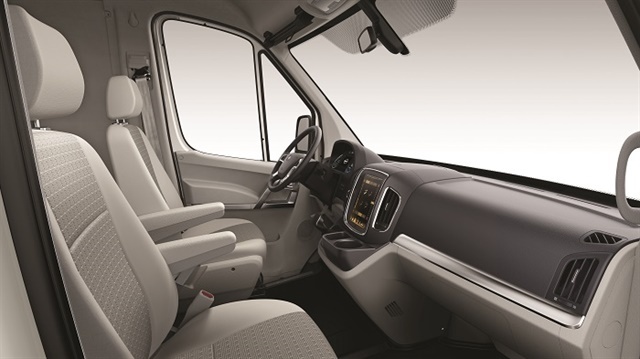 An optional bulkhead with a sliding door is available that would seal the driver’s area from the cargo compartment. The driver’s area is quite similar to most other such vehicles; it’s easy to climb into and nice and roomy. The visibility around the van is very good, with massive front and side windows. The mirrors looked a little small from the outside, but the visibility was actually very good. The basic controls are also similar to other vans, with a dash-mounted “gear shifter,” steering-wheel-mounted radio and telephone controls, and stalk-mounted turn signals, wiper controls etc., all in familiar places. There’s a 10.4-inch Android-based touchscreen display with LTE connectivity in the center console that displays climate control information, along with radio, Bluetooth connectedness and various on-board system menus. It’s bright and easy to navigate even when the sun is shining on it, but it’s just far enough out of the driver’s direct line of sight that it wasn’t distracting. The dash A-panel displays the usual speed and mileage info along with a state-of-charge indicator and estimated available miles. The center display screen shows, among other things, animations of the power draw from the batteries to the wheels and vice versa when in regenerative braking mode. There’s nothing here that drivers will not be immediately familiar and comfortable with, and I thought the whole control and display setup was intuitive and easy to use. I didn’t need to intervene with anything beyond the turn signals. The dash A-panel displays speed and mileage info as well as state-of-charge and estimated remaining miles. 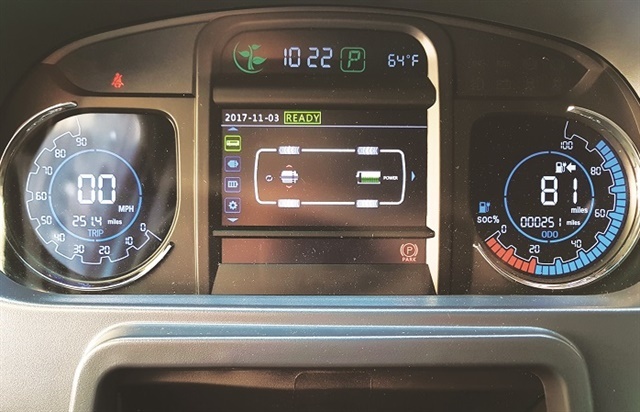 Drivers can navigate through a variety of system screens, including one that shows energy transfer from the motor to the wheels and vice versa when regenerative braking occurs. My chance to drive the Chanje V8070 came in late October in Brooklyn, New York. Chanje had a place set up for media events and customer ride-and-drives on Kent Ave., a few blocks from the Williamsburg Bridge in the north part of the borough. That afforded me the opportunity to drive through the area’s narrow, busy streets, as well as to get a few miles at highway speed on I-495 and I-278, which pretty well covers the sort of territory in which the van will operate. The van uses a proximity key system. To turn it on, you press the power button on the dash. The system runs through a series of checks and the dash lights up, followed by a very faint humming sound. To set the van in motion, you pull the “gear selector” into Drive and release the electronic parking brake. The van does not immediately begin to roll as would a conventional powertrain with an automatic transmission. The accelerator pedal is sensitive, but not overly so; a slight depression was all it took to get the vehicle moving. A more aggressive application gets it moving in a more exciting fashion. Are Electric Trucks A Zap in the Pan? Wandering up and down Kent Ave. and taking a few detours on the side streets let me get a feel for the van. It feels much the same as a typical panel van, and as the marketing material suggests, it doesn’t feel as large as it is. It has a tight turning radius and the rear overhang is sizable. The overall length is about 26 feet, but the wheelbase is just 16 feet, so it’s very agile. I managed to parallel park the thing with ease — albeit in front of a fire hydrant, because there is no parking to be had anywhere in Brooklyn (I didn’t stay long). It’s certainly a lot quieter than a diesel-powered van. I got a couple of sideways looks from pedestrians who were clearly taken off-guard by its silent propulsion system. As is the curse of all non-engine-powered vehicles, the other noises were much more obvious, like a few rattles from the paneling in the cargo section. The interior is cavernous, so recording a few bits for an upcoming video on the drive, it sounded a little echo-y inside. Filling it with cargo would certainly mute most of the noise and the rattles, but the manufacturing process will have to be such that everything is securely fastened down to avoid customer complaints. Don’t get me wrong — its wasn’t noisy per se, but absent the roar of the engine, everything else is just a little more obvious. I navigated my way to McGuiness Ave, across the Pulaski Bridge and up onto the Long Island Expressway (I-495), and for a brief shining moment actually had the van up to 60 mph. You want to talk about acceleration? I got up to speed in no time (and yes it was a bit noisier at highway speed). Had I been loaded it might not have taken off as quickly, but I’m sure the performance would be as good as or better than a diesel with my foot to the floor. And as I was warned, when I hit the Brooklyn-Queens Expressway, traffic pretty well came to a halt. I spent the next 30 minutes crawling toward my exit at Meeker Ave., which I thought made this test drive just that much more realistic. In all, I put about 10 miles on the truck — my shortest test drive ever — in about 90 minutes. The state-of-charge went from 81% to 65% in that time. I can’t say that’s an accurate indicator of battery life (I was empty after all), but energy consumption seemed to be in line with what Chanje projects. I think the Chanje V8070 has tremendous potential in the last-mile market, and with its enormous cargo capacity, there are lots of reasons to be optimistic about its future. Users will have no difficulty adapting to the electric powertrain, as it’s no different to operate than a conventionally powered van. The fit and finish of the cab interior is as good as Ford’s Transit, but it lags a little behind the Sprinter. I see no reason Chanje couldn’t up its game on that once it begins manufacturing here in North America. The V8070 will certainly have great appeal among delivery fleets concerned with their carbon footprint, and they will be that much happier knowing they are giving up nothing to gain that distinction. It’s a big, nicely setup delivery van that just happens to be electric. Updated 2/5/2018 to clarify the reason for what looks like a traditional engine tunnel.